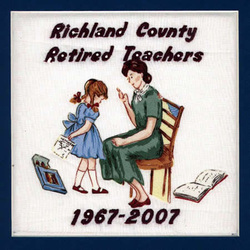 Richland County Quilt Block Story This club, now forty years old, has matured and met the usual challenges that age brings. Our members have put in 25,207 volunteer hours this past year. We are a traveling group with members going on a cruise to Mexico and many bus trips. A large number of our members can be found in the lounge of the luncheon meeting place chatting with old and new friends long before the beginning of each meeting. We like to be entertained and informed. Our meeting programs are always relative, current, and interesting. We use up-to-date experts on a variety of subjects to keep us moving forward.